One of the first axioms of analysis is: "Garbage In, Garbage Out"! If your data is flawed, everything you do with it and the decisions stemming from it are flawed and dangerous to your financial health. Experienced analysts will often be found relentlessly checking, rechecking and validating their inputs and assumptions. If only our economists and the sell side analyst community were this diligent. But then it isn't their money. Only a year-end bonus for the 'extras' in their life is at risk. If economic practitioners were held to higher standards of accountability, they simply wouldn't accept the raft of fundamental data points that are the pillars of most economic assessment. I am talking specifically about government inflation numbers such as CPI and PPI, the Deflator and GDP growth statistics and true debt levels using sound GAAP accounting principles and reflecting off balance sheet special purpose entities, contingent liabilities and financial guarantees. The list of government reporting irregularities is pervasive and for unknown reasons, simply accepted. It is incredulous that we can just accept, without challenging, the statistical hyperbole of Hedonics, Substitution, Imputation and Proportional Distribution, justifying inflation numbers that don't even pass the common sense of an unemployed high school dropout. I don't mean to disparage the high school dropout, but I do point the figure at the 'six figure' analysts who accept this tripe as gospel, and from whose analysis fiduciary investment decisions are made with the unsuspecting public's hard earned savings. This problem has been going on long enough that flawed data has resulted in broad based asset mispricing and malinvestment. Data points have become so distorted, as to be delusional, and have left the markets dysfunctional. How else do you explain $2 trillion excess investor savings over loans now sitting at US banks? How else do you explain Capital Investment (CAPEX) falling faster than Felix Baumgartner from 128,100 feet? 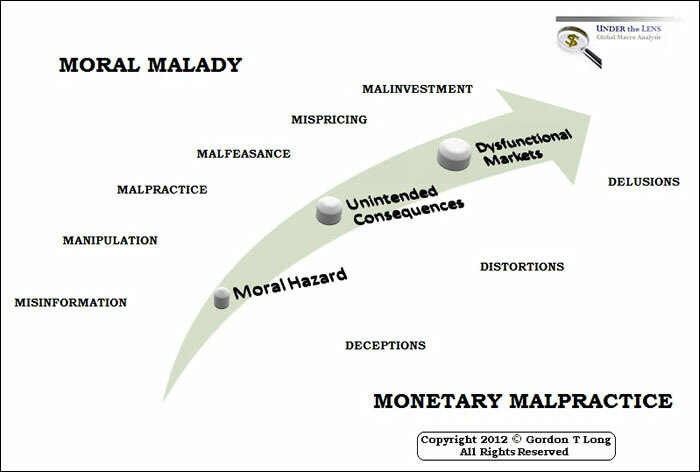 This is the third in a trilogy on Monetary Malpractice, so I will refer a lot of the discussion on the chart to the right, to those wishing to read Monetary Malpractice: Distortions, Deceptions and Delusions or Monetary Malpractice: Moral Malady. I would like instead to focus on the specific mechanism by which Monetary Malpractice has now delivered Dysfunctional Financial Markets. Before I drop you into the 'gearing' of it, let me show you the bottom line results. 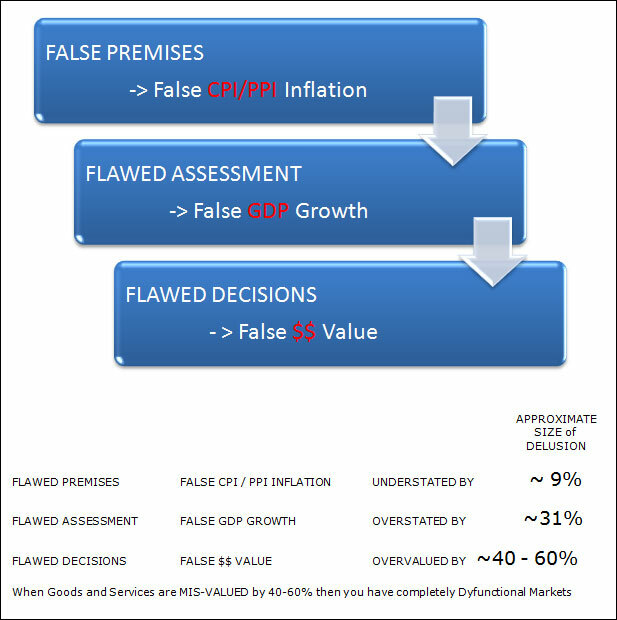 Dysfunctional Markets exist when normal and expected 'causes and effects' no longer occur. If you distort the inflation data through misinformation and manipulation, then all data stemming from it is obviously flawed. If in turn that data is further distorted, then the delusion becomes greater until it disconnects from reality and the system becomes dysfunctional. The manipulation and distortions presently occurring in the government's CPI & PPI inflation numbers are so significant that it requires an exhaustive discussion. An extensive number of presentations with leading analysts on this specific subject can be found in the Macro Analytics Library. I have compiled the following chart to best summarize the areas that must be covered in such a review.